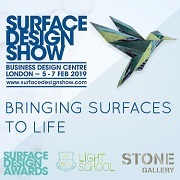 Trade shows galore! Heimtextil, Domotex, IMM Cologne, Maison&Objet, Paris Deco Off, and more. Everything is simultaneously simple and complex. Progressive design promotion involves the titillation of the five senses to bring about a unique and immersive experience. We see this with Heimtextil’s Theme Park and trends. We also explore product developments for the new seasons. Neo-artisans put a new spin on craftsmanship. Artyculturists curate nature’s talents. Technophobes delight in the Robolution of Techno Made. Get inspired with the February edition! Frankfurt — As we have been told time after time, in terms of contemporary consumer trends, it is all about immersing the buyers in emotional, sensory experiences. Not only did the Theme Park keep in line with its predecessor and deliver four trend directions for home textiles, it brought to the table much more by looking at other movements within design. Also in this issue you will find the usual round up of Maison&Objet’s trend trail and highlights from other design happenings we attended. Frankfurt — The installation by designer Bart Hess, “Work With Me People” plays with the ideas of mass production, elite textiles, and human labor. This interactive workroom allows visitors to experience a taste of pressure from the production line as they are given the opportunity to suit up and aid in the creation of two haute couture textile designs. Frankfurt — The contract market is something the design industry has been putting a heavy focus on in recent years. Within the contract market lays hospitality. From spa facilities to hotel rooms, textiles - window and wall treatments, floor coverings, bedding, and upholstery - all need to be considered. There are the materials you would expect, and then there are some innovative ones just entering the market here for the first time. Frankfurt — In today’s online world, what are retail stores for? Walk this way for a compelling option, a place where the windows show the store as a gallery, where textiles and wallpaper are treated as art. It is a feast for the eyes decoded by a panel detailing all of the vendors. People may still buy from home, but storefronts maintain their positions as marketing masters. 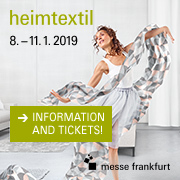 Frankfurt — Experiencing design at Heimtextil is not limited to home textiles. Inspiration comes from many sources, even food. Sweet scents mingle in the air of the Theme Park, beckoning visitors to come explore their origin. Bright colors and friendly artisans greet onlookers who discover that there is a mini candy factory sharing its talents with all who care to tempt their taste buds. Of course there are also fabrics as delicious as the confections! 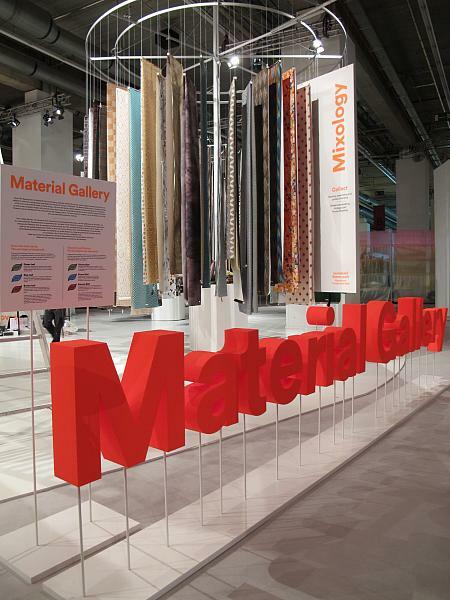 Frankfurt — The Technology Lab at Heimtextil's Theme Park shows a vision of the future. Students form TU/e Technical University Eindhoven showcase their research on interactive textile designs including materials that appeal to our heightened interest in tactile and sensorial stimuli and a concept by designer Boree Akkersdijk. Rudi Boiten demonstrates a computer-controlled way of drawing carpets on the floor. Frankfurt — The fabrics here are diverse as the world’s cultures: Native American tribal prints, tie-dyes, weaves of ropes, feathers to form a checkered pattern, flower petals pressed on a sheer, cork spliced with textiles, and colors embracing the entire spectrum. Mixology also has a special focus on reuse, upcycling and recycling; it is progressive and eco-sensitive. Frankfurt — Metallic splattered velvets, wallpaper that looks like moon rock, zigzag jacquards, sequined decorative pillows, prints of pebbles, crackle effects, and materials that look as if they have been worn by time. In Discovery we feel the need to protect, and as a reflex, be protected from the consequences of our improvidence. Frankfurt — As digital sterility pervades our lives there is bound to be a reaction, so interior designers are creating new environments that appeal to very human stimuli to generate more sensorially satisfying, immersive experiences. There is a fascination with synesthesia, in which the stimulation of one sense leads to a reaction in another. Frankfurt — Fed up with consumerism and left feeling empty by social media relationships that don’t fulfill, consumers now wish to prioritize personal fulfillment and well-being. The foliage and flowers of botanical art decorate fabrics and wallpapers, sheers, lace, intermingle with classic plaids and stripes; they are materials for which we have an emotional connection. Paris — Maison&Objet’s “Observatoire de la Maison” or Home Observatory team has chosen the theme MAKE to showcase the influential directions the marketplace is taking. After publishing a preview for you in November outlining the sub-themes of Nature Made, Human Made, and Techno Made, Trendease is happy to present you with coverage hot off of the trade show floor. Cologne — Another week jam-packed with trade shows has wound down. Intirio in Gent and Creativeworld, Paperworld, and Christmasworld in Frankfurt kept us on our toes. For this week’s newsletter we transport you to a reinterpreted Shanghai lane house envisioned by American educated, Chinese designer architects Neri&Hu, defining the intersections of public and private space, for imm cologne’s Das Haus. Paris — In this newsletter’s gallery subscribers will journey through the workshops of craftsmen and women in France who work with glass, wood, metal, and ceramics. What is trending? Read the tidbits within and virtually explore the vast talents of these ateliers in approximately 100 images. Ghent — For this week’s gallery, a selection of 40 images, Trendease takes you through the trend area of Intirio in Ghent, where the three 2015/2016 trends from MoOD Brussels were reinterpreted for the show catering to more than just textiles. Subscribers can journey through the passages and varying styles without leaving their computer screens.